Handcrafted Ampersand Value Series Unprimed Basswood Artist Panels are perfectly smooth, non-flexing, and ready to prime with the ground of your choice. Basswood is an excellent material for artist panels because it's seamless, knotless, and non-fiber-raising. 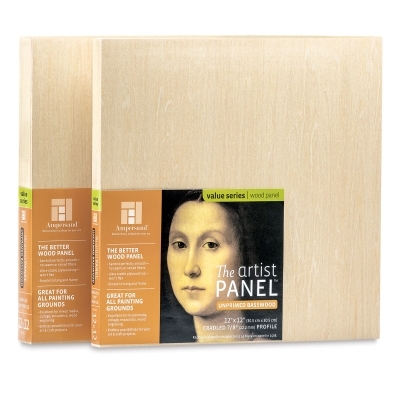 This panel is handcrafted using a thick, non-flexible basswood top, sanded perfectly smooth. It is ready to seal and prime with the ground of your choice. Unlike other plywood panels, you don't have to worry about knots, seams, or excessive wood grain. The fine, uniform characteristics of basswood offer a better, imperfection-free surface. Thick and durable, this panel gives you superior stability. It will not flex, even with heavy paint and wax layers. The cradle is crafted from solid pine that can be finished with paint or stain.